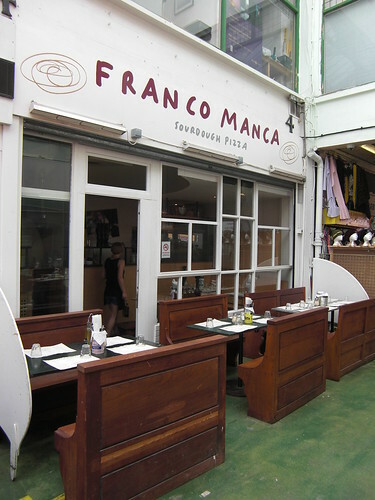 Its taken me a while, but I have finally managed to make it all the way to Brixton and sample the delights of Franco Manca, a pizzeria making and selling Neapolitan style pizzas located in the heart of Brixton Market. The embarrassing thing is that I live literally 10 minutes away by bus, and coming from a self-confessed pizza fan, I hang my head in shame that I had never made the journey earlier. Anyway, confessions aside, Brixton Market can be a bit of a maze. Split up into various sections, it came across as a warren of corridors, filled with exotic fruit and veg, strange people selling even stranger produce and a wealth of shops peddling African women's hair products. 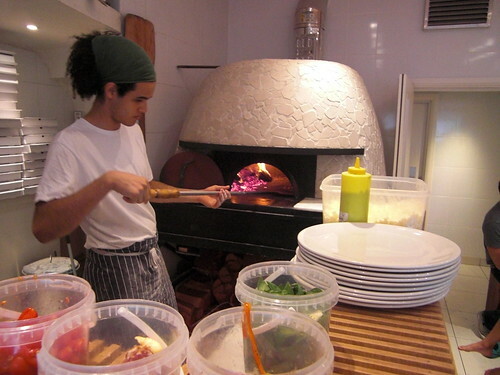 In amongst the madness, you will eventually come across Franco Manca, an open fronted restaurant split in half by the meandering halls and a massive wood fired oven either side. We were early, as we were warned that arriving a minute past twelve meant certain queuing. 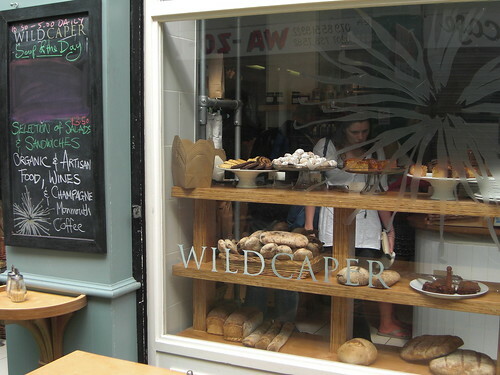 In fact, so early were we that we ended up in the deli/bakery next door (Wild Caper for those that may be interested), where we sampled two lovely coffees and bought some fine sourdough bread (my sister bought some sprouts, but I'm not really into that sort of thing). Dang, we took our eye off the ball. 11:50 and the seats were all nearly filled! How this happened, I will never know but we managed to snaffle the last two seats and gazed at the menu. 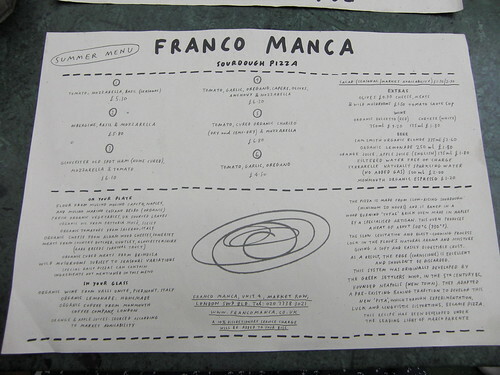 The menu is curt to say the least with 6 pizzas on the main menu and 2 on the specials. I desperately wanted to try one of the "white" pizza specials, but I needed to try the tomato base first so chorizo with extra mushrooms for me. 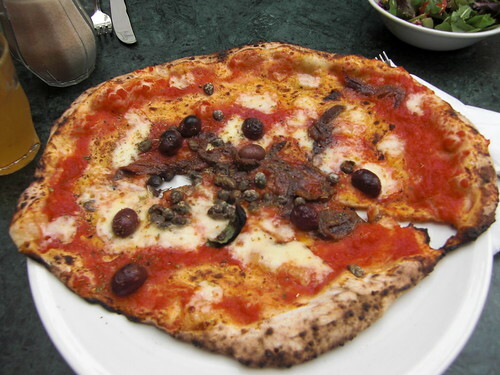 The sister went for a number 4, the salty special (capers, anchovies, olives etc...). We had also ordered a side salad and I hate to say it, but this nearly stole the show. Not only was it beautiful to look at, but each constituent part was well thought out and tasted fresh and light. 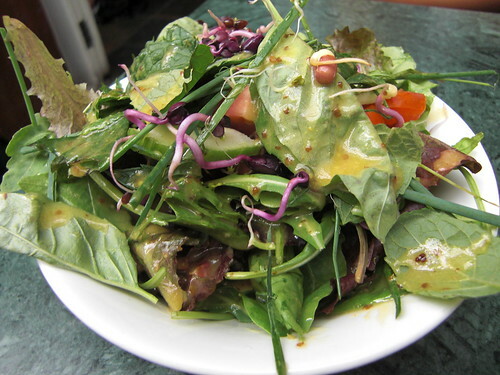 Purple sprouts, an assortment of herbs and leaves and even a few chickpeas added great contrasts in flavour, pepperiness and texture, with the slightly sweet vinaigrette adding the icing on the cake. And then the pizza's appeared, and they were everything you could want in a pizza. Arriving with that slight char from the wood ovens, dough bubbling at the edges then crisping up to give that requisite crunch. Thin and light throughout, complemented by top quality ingredients, all sourced by the owner himself, the proud providence of the ingredients displayed on each and every menu. This really was quite special. I really want to proclaim Franco Manca as one of those hidden local neighbourhood gems, but as the queues testify, this is anything but. 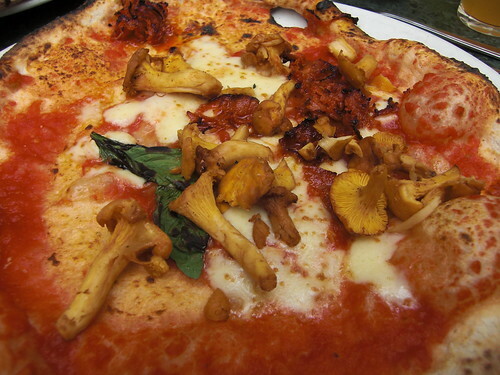 The word is out and the masses flock to Brixton to sample these fine pizza's. I asked the waitress if they were considering expanding and she politely declined to answer. Secretly, I hope they don't. If they rolled this out it would certainly lose a large amount of its charm, and I certainly don't think your going to find a better location than in the heart of Brixton Market. Looks like they've upped their game on the salad, the one I had was decidedly more boring. The Brixton market location is all well and good, but in the winter... I froze my toes off and had to eat with my coat on! Shame on you! Glad you finally went and enjoyed it though. The salad really looks more impressive than the one I had. I think I had the number 2 pizza. Can't wait to go back as it's about the only thing I can afford with my new travel plans! They've definitely upped their salad game recently to match the awesomeness of the pizzas. The (very cheap) wine is typical italian table plonk, best drunk with a splash of water.